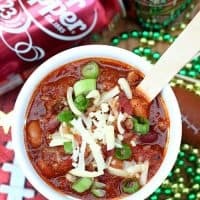 DR PEPPER GAME DAY BEEF CHILI — If you’ll be cheering for the home-town football team this season, this Dr Pepper Game Day Beef Chili is a great way to feed friends and family, whether we’re tailgating at the stadium, or watching the games from home. This hearty chili is perfect for football season, and easily adaptable so you can serve it over and over again. If I’m serving just the chili, I like to use chunks of seared beef for a really hearty meal. But when I make it for chili dogs and nachos, I use ground beef instead. After I sear my meat, I saute onions and peppers in the same pan. It’s an extra step, but one that’s well worth it for all of the amazing flavors it adds to the chili. The seared meat and veggies are added to a slow cooker along with beans, tomatoes and Dr Pepper for a flavorful, slow-cooked chili everyone will love! 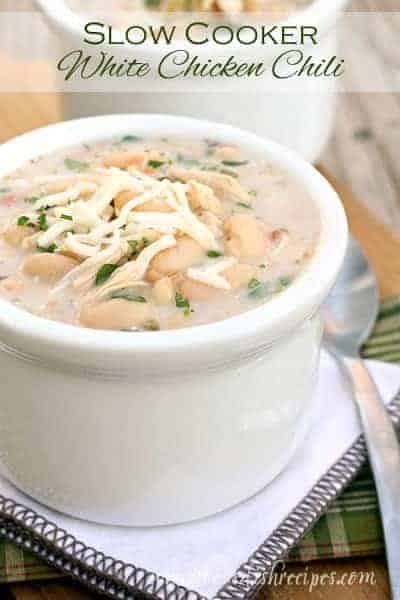 Living in Colorado, game-day can be pretty chilly sometimes, so I love having a heart-warming recipe like this on my tailgating menu. We all have our favorite chili toppings in my family, so I like to put out a variety of options for people to choose from. 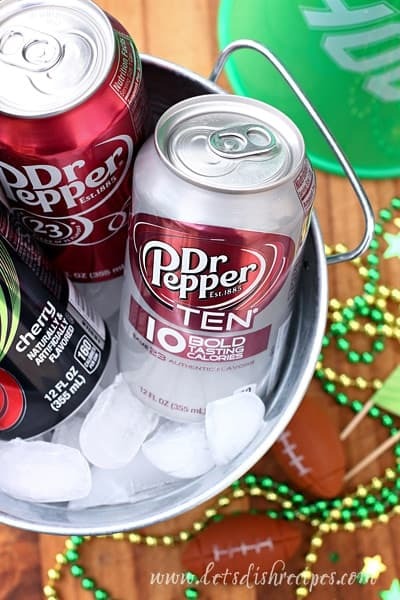 A selection of Dr Pepper to drink is also a must on game day. I like to fill buckets with ice to keep our soda cold, but if you’re headed to the stadium, a cooler is the way to go! 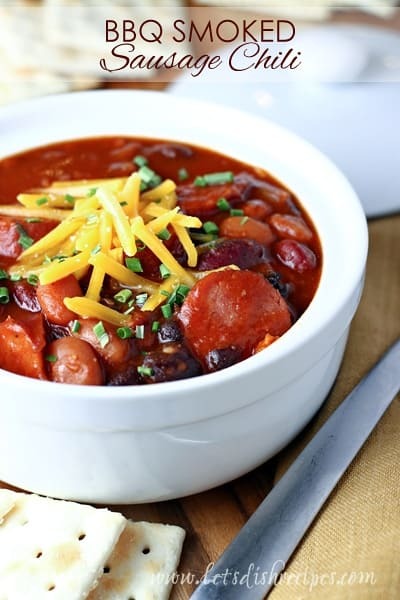 Here’s a great tip for your next tailgate party: serve chili and soups in paper cups. They’re easy to hold, especially for your younger guests, and if you’re tailgating at the stadium, they keep your hands warm on chilly days. 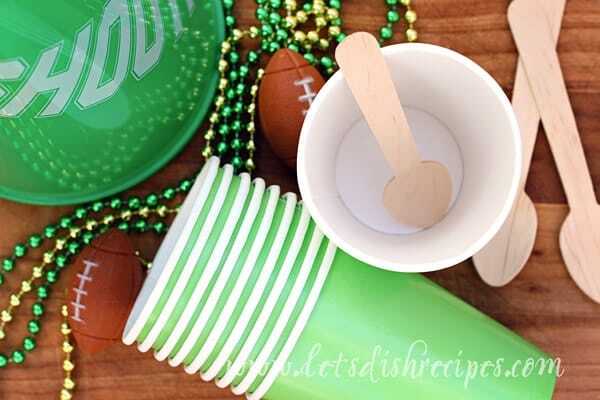 Plus, you can get cups in team colors to make your game-day party even more festive! Just make sure you get sturdy cups that will stand up to a hearty chili. 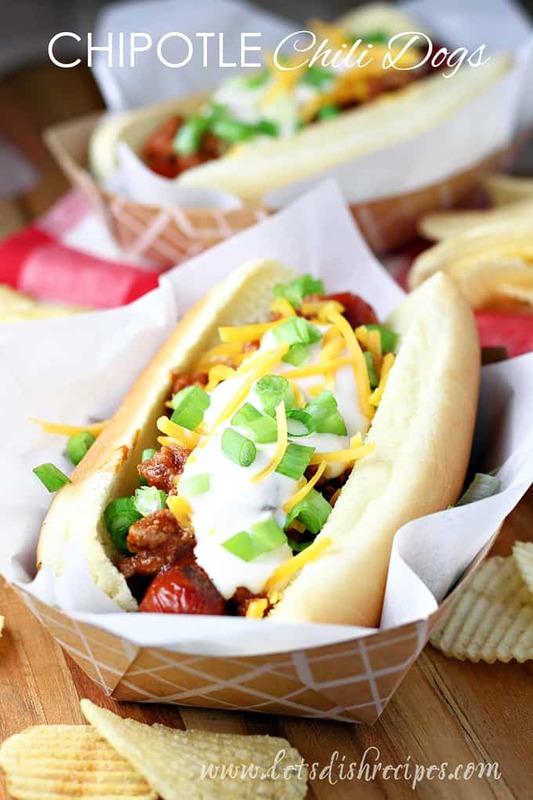 Bread bowls are another great option for serving chili, whether at home or at the game. If you do a lot of tailgating at the stadium, here are a few other great tips for game day. 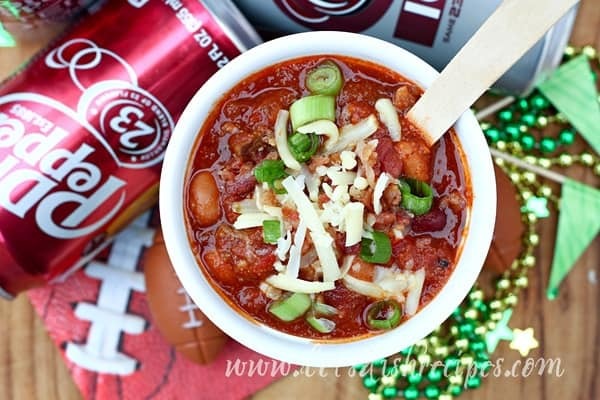 One thing is certain, however you serve it up, you’ll be ready to entertain like a champion on game day with Dr Pepper and this hearty beef chili! 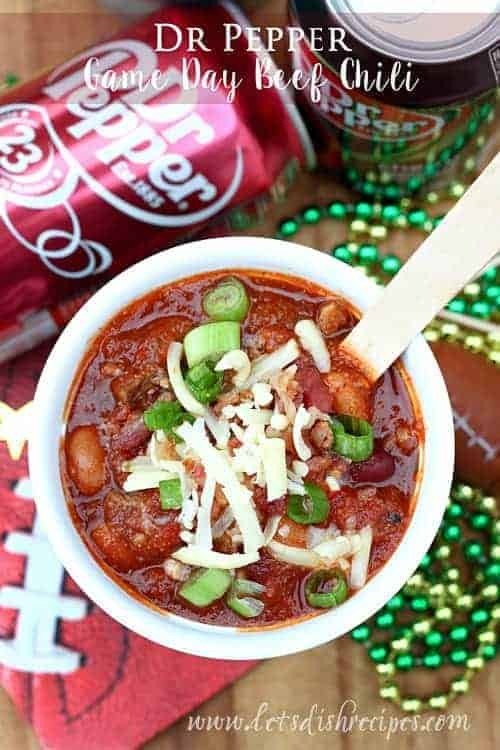 Be sure to save this Dr Pepper Game Day Beef Chili recipe to your favorite Pinterest board for later. If you'll be cheering for the home-town football team this season, this Dr Pepper Game Day Beef Chili is a great way to feed friends and family, whether we're tailgating at the stadium, or watching the games from home. Cut roast into bite-size pieces. Heat one tablespoon oil in a large skillet over medium-high heat. Sear the meat on all sides, being careful not do crowd the pan, working in batches if necessary. Transfer the meat to a lightly greased slow cooker. In the same pan, saute the onions, peppers and garlic, adding more oil if necessary, until soft, about 5 minutes. Add to the slow cooker along with the meat. 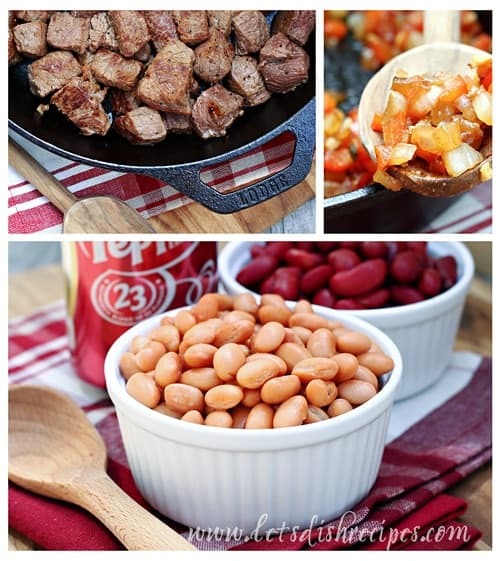 Stir one can of Dr Pepper, along with the tomatoes, spices and beans into the slow cooker. Cover and cook on low for 8-10 hours. About 30 minutes before serving, stir in the cornmeal (this will make your chili nice and thick). 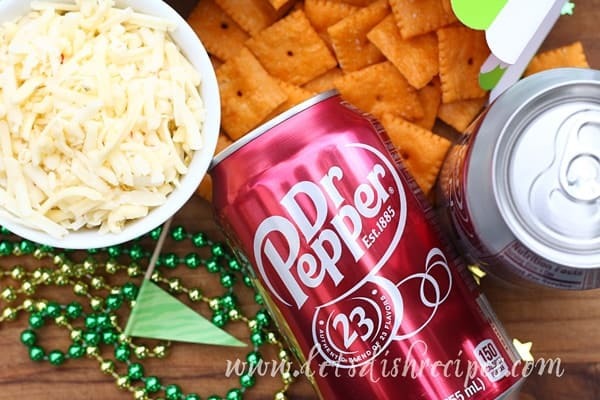 If desired, stir in more Dr Pepper just before serving (I usually add another half a can). Serve with desired toppings, such as cheese, sour cream, chopped veggies, corn chips, etc. I remember the first time I heard someone say they had put a carbonated drink in their chili. It was like ketchup on eggs. So strange. Then I tasted it. WOW! It’s absolutely delicious. Football and chili go so well together too. You can feed a million people with very little work. Thank you for your recipe. That is some serious chili right there! I live in Texas, a part where it really doesn’t get that cold, but a part of Tx that really loves to make, and eat chilie… I think I’ll make this one… thank you. I love chili, one of my comfort food(s), have never tried it with carbonated drinks. ; will definitely try this one out. Did I miss the part where you put the spices in? Step 3 is where it mentions adding the spices.